Spreading cow manure on hay fields is a simple way to replace nutrients, add organic matter and help recycle a farm waste product. With the cost of fertilizers going up, manure is a less costly alternative. If you grow hay for sale or bale it for your own use, you remove many nutrients that must be replaced. Manure is a great way of accomplishing that. All manure is organic manure. It is a natural by-product of cattle and by spreading it back over the ground adds to the completion of the nutrient cycle. Alfalfa and grass hay remove similar amounts of nutrients. What is removed is about 13 lbs of Phosphorus and approx. 50 lbs of potash per acre. If you are haresting 2.5 tons per acre that equals 32.5 lbs of phosphorus and 125 lbs of potash per acre. A good way of helping to replenish these nutrients is with manure, both liquid and dry. There are different ways to apply the manure, but what is most important is to get an even spread with no clumps. Using a drag-line is one way, however a truck or tractor works well. Many spreader are available for rent. One thing to keep in mind, large trucks may leave behind deep wheel trenches. For those who use drag lines, this eliminates much of that problem. If you are not sure how many tons per acre your solid manure spreader applies, here is a quick way to check. Cut a piece of cardboard 56" by 56". Stake it firmly to the ground. Drive over the square spreading manure. Push the cow manure on the square to the center of the cardboard and fold in half. Dump the manure into a large bucket and weigh the manure subtracting for the weight of the bucket. Each pound of manure equals one ton of cow manure spread over an acre. 1. It is best to apply cow manure right after harvest. You eleminate the burning of new growth and it gives it a little more time to breakdown. 2.Try to apply before rain is expected. If not, apply to dry ground. If the ground is saturated it may be best to wait until it has dried some to prevent soil compaction. 3. While dry and liquid manure can be used, dry manure must be spread evenly with no clumps. 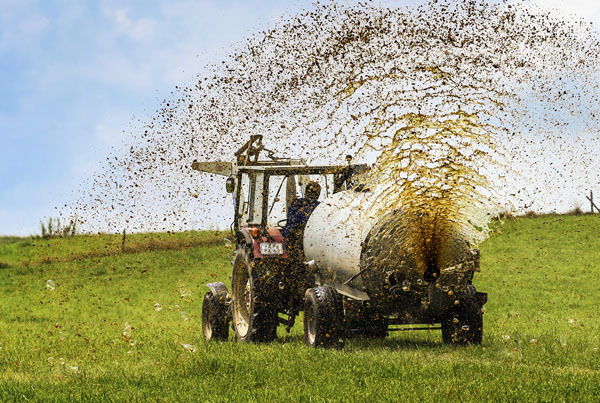 It is often believed that liquid manure is best if you are concerned about smothering plants or if you dont have the equipment to guarantee a no-clump spread of dry manure. 4. According to university studies, a 1000 gallons of slurry may contain approx 25 lbs of nitrogen and a ton of dry manure approx. 10 lbs of nitrogen. The actual amount depends on many factors and that percentage may vary greatly. 5. Cow manure really shines when applied on poor soil conditions. It can help increase soil microorganisms and build soil composition, including organic matter. 6. Raw manure may consume a portion of the available nitrogen during the process of decomposition. Only about half of the nitrogen in manure may be available to the grass. 7. The more composted the cow manure is the better it is for the soil. For manure that is not yet well-composted, there will be some depletion of nitrogen needed by microorganisms to complete the breakdown. 8. Be aware of the possibility of Johne's Disease from contaminated manure. 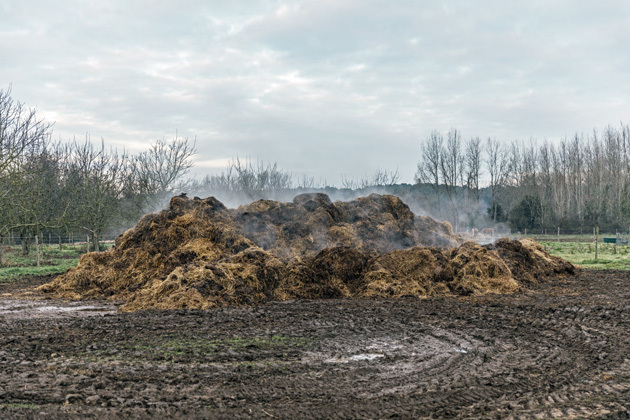 Fully composted manure may be free from pathogens because of the heat generated during manure composting. 9. Be prepared for additional weed growth from cow manure. The weed types will depend on the quality of grass the cows have eaten and the degree of composting. Foliar Blend is an exceptional product to apply on pastures. The prebiotic nature of the product causes and explosion of growth and activity of beneficial soil microorganisms. This explosion of microorganisms greatly increases the breakdown of cow manure, plant stubble, and soil elements so nutrients gets to plants faster. Proven benefits include iextreme expansion of plant root growth. It can double the size of root numbers and reach. In addition to the expanded root reach it also increases Mycorrhiza production. Mycorrhiza is an beneficial fungus that attaches it self to roots and extend roots ability to absorb nutrients. Mycorrhiza form long strands that extend beyond the root's reach and actually deliver nutrients back to the plants. This symbiotic relationship always makes for healthier plants. Support water absorption and uptake. Increases crop quality and yield. Allows you to use less fertilizer while maintaining a higher quality grass due to the increased activity and action of soil microorganisms. Golf courses, for example, who are under great pressure to decrease use of nutrient inputs use 35% less nitrogen and other nutrients yet deliver a higher quality turf using Foliar Blend. It applies to hay as well. Plants are better able to handle stress and heat as well as drought conditions. The complex carbohydrates, amino acids, and enzymes in foliar blend increase the plants ability to conduct photosynthesis. 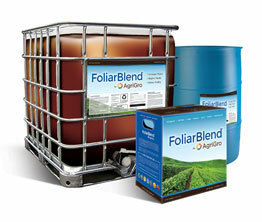 You only need 1 to 2 pints per acre of Foliar Blend, which is a little more than $12 per acre. Foliar Blend will improve your harvest tremendously in both volume and quality as well as breaking down soil elements and manure faster producing better soil and crops. Contact Russ for more information on Foliar Blend. Please click the link "Contact Us" for information.